It’s official, we will now also include the troops going through rehab at the USMC Camp Pendleton Wounded Warrior Battalion West (WWBn-W) facility. The Wounded Warrior Regiment headquartered in Quantico, Virginia commands the operation of two Wounded Warrior Battalions located at Camp Pendleton, California (WWBn-W) and Camp Lejeune, North Carolina (WWBn-E). We welcome Pendleton’s WWBn-W. Ooh-rah Marines! This means we have officially two sets of troops going through Operation Game On as well as our other distinguished soldiers and of course the Wives of Warriors (WoW). September 9th: Sessions start for the Naval Medical Center San Diego (NMCSD) troops with lessons given by Ted Norby and his staff from the National University Golf Academy. September 10th: Sessions start for the Wounded Warrior Battalion West (WWBW) troops with lessons given by Matt Clay and Chris Lesson from the Del Mar Golf Center. 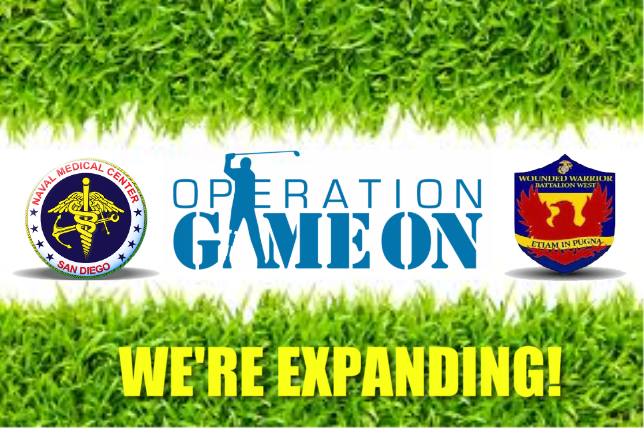 All of our Operation Game On sessions will continue to be held at the Del Mar Golf Center. Thank you very much for your continued support. We are making a difference in a very important part of the lives of our returning combat-injured troops. They hear your prayers, they see your support, and they know that people like you are now watching their back. God Bless and continue to protect our troops!